Home » Blog » injection molding » what is plastic mold? The tooling used for plastic injection molding is called plastic mold or plastic injection mold. Most plastic products are molded by plastic molds. Plastic molds are divided into two types: thermosetting and thermoplastic mold ,according to the molding plastic characteristics. Based on the molding process, the plastic mold is divided into plastic injection mold, blow mold, casting mold, pressing mold,and so on. The injection mold consists of two parts: the moving half and the fixed half. The moving half is installed on the moving platen of the injection molding machine, and the fixed half is installed on the fixed platen of the injection molding machine. During the injection molding, the movable and the fixed half are closed to form an injection system and a cavity system. When the mold is opened, the movable half and the fixed half are separated to remove the plastic product off the plastic mold. 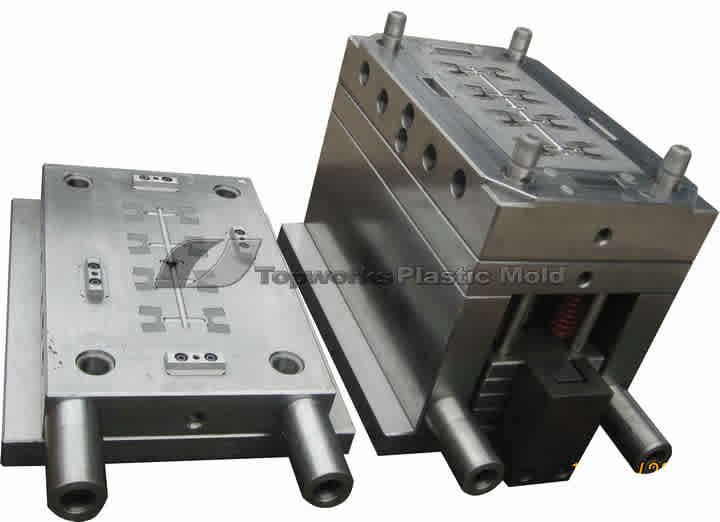 In order to reduce the mold design and manufacturing time, most of the plastic molds use standard mold bases. The plastic mold is mainly composed of injection system, temperature control system, part forming system and ejection system. The injection system and the part forming system are in direct contact with the plastic and they change with the different plastics and products. Those 2 systems are the most complex and most varied parts in the mold and require the highest finish and accuracy. The part-forming process refers to the melted plastic heated by injection molding machine is injected into the mold cavity. After cooling and solidification, it get the molded products.Which simplifies as :mold close – injection – pressure – cooling – mold open – ejection. mold insert: it is used to form plastic products, plastic mold factory normally makes it by itself, most of the processing time is spent on the producing mold inserts. mold auxiliary parts: they include location ring, nozzle bushing, support pillar, ejector plate, guide bushing, guide pin, lifting ring and so on. 1) Injection system: The injection system refers to the flow path part before the melted plastic enters the cavity from the nozzle, including the main runner, the cold slug, the sub-runner and the gate.It is directly related to the molding part quality and production efficiency. 2) ejection system: ejector pins, blade pins and sleeves. special mechanism: if the product has the undercut or side wall hole , the plastic mold needs to design the side core pulling mechanism (also called the slide), the inclined core pulling mechanism (also called the lifters), the oil cylinder (when the side core pulling distance is long). 2 plates mold: another name of the sprue gate mold, also known as the single parting line type plastic injection mold, its characteristic is the simple mold structure, but the sprue is a part of the injection molded part, and it need to be manually removed later; 2 plates mold structure is widely used for various kinds of mold. 3 plates mold: also known as the pin point gate mold, also the double parting line type injection mold.Its gate characteristic is pin point, the gate cross section is small.The injection molded part appearance is good, and because it does not need the manual removal of the gate later, it is advantageous for the automation production.But 3 plates mold structure is more complex and the cost is higher, it is generally applicable to the small and medium plastic parts. and plastic molding with good fluidity. the biggest difference between the 3 plate mold and the 2 plate mold is that the three plate die has extra runner plate (automatic remove runner). It is a section of the mold that connects the nozzle of the injection molding machine to the runner or cavity. The top of the runner is concave for engagement with the nozzle. The one end diameter should be slightly larger than the nozzle diameter (0.8mm) to avoid extra flowing and prevent the two from being blocked due to inaccurate alignment. The diameter of the one end depends on the size of the product, usually 4-8 mm. The diameter of the runner should be enlarged inwards at an angle of 3° to 5° to facilitate the demoulding of runners. It is the channel connecting the main runner and each cavity in the multi-cavity plastic mold. In order to make the molten material fill the cavity at equal speed, the arrangement of the runners on the mold should be symmetrical and equidistantly distributed. The shape and size of the runner affect the flow of the plastic melt, the release of the product and the mold making. Trapezoidal or semi-circular cross-section runners are often used, and they are cut on half of the mold with an ejector pin. The surface of the runner must be polished to reduce the flow resistance to provide a faster filling rate. The size of the runner depends on the type of plastic, the size and thickness of the product. For most thermoplastics, the cross-sectional width of the runner is not more than 8m, MAX 10-12m, Min 2-3m. the cross-sectional area should be design as small as possible to reduce the plastic material and short the cooling time. It is an extension located at the end of the runner to trap the cold material between the two shots, thereby preventing the clogging of the runner or the gate. If the cold material is mixed into the cavity, the internal stress is likely to occur in the injection molded product. The Cold slug has a diameter of about 8-10 mm and a depth of 6 mm. In order to facilitate demoulding, the bottom is often seized by a puller. The top of the puller should be designed as a zigzag hook or a depressed groove so that the cold slug can be smoothly pulled out during demoulding. In order to meet the mold temperature requirements of the injection process, a temperature control system is required to adjust the temperature of the mold. For injection molds for thermoplastics, the cooling system is primarily designed to cool the mold. The common method for mold cooling is to machine cooling water lines in the mold and use circulating cooling water(or oil) to take away the heat of the mold. In addition to heating the mold, hot water or steam can be used in the water lines, and electricity bar can be installed inside and around the mold. It is a shallow slot opened in the mold to discharge the gas in cavity and the melt brought. When the molten material is injected into the cavity, the air in the cavity and the gas brought in by the melt must be discharged from the mold through the slots at the end of the flow front. Otherwise, the product will have bubbles, weak weld lines, short shot …. Even the accumulation of air, due to the compression, generate high temperatures to burn the product. the vent slots can be located either at the end of the melt flow in the cavity or on the parting surface of the mold. The latter is a shallow groove that is 0.03-0.2mm deep and 1.5-6mm wide at the side of the plastic mold. During the injection, the vent slots will not leak much molten material, because the molten material will cool down at this place and solidify the channel. The position of the vent slots must not be facing the operator to prevent accidental ejection of molten material. the clearance between the ejector pins and the ejector hole, clearance between the ejector bar stripper plate and the core, can be a way to discharge the air. The gate of plastic mold refers to a short flow path between the runner and the cavity, which is the entrance of the resin into cavity. It is the channel connecting the runner and the cavity. The cross-sectional area of the gate can be equal to the runner, but it is usually reduced. So it is the smallest part of the entire runner system. The design of the gate is related to the size, shape, mold structure, injection conditions and properties of the plastic parts. It could facilitate the separation of products and runner system. The design of the gate shape, size, and location depends on the plastic, the size and structure of the article. the shape of the cross section of the gate is rectangular or circular, and the cross-sectional area should be small and the length should be short. Gate location should generally be selected where the product is thickest without affecting the appearance. The shape, quantity, size and location of the gate will have a great influence on the quality of the plastic parts. So gate selection is one of the key points in plastic mold design. 1) the stress near the gate is large, and the product stress is uneven and easy to deform . 2) it is necessary to manually remove the gate with extra works, also it will leave obvious gate marks on the product surface. 1) it is suitable for large and deep barrel shaped parts. For plain parts, it is prone to warpage due to shrinkage and stress. 2) for parts that are not allowed to have gate marks on the surface, the gate can be set into the inner surface of the part, that is an inverted mold. 1) simple shape and easy machining. 2) it is easier to remove the gate. 1) the product can not be separated from the gate automatically. suitable for all kinds of parts, but not for long barrel profile parts. 2) the gate can be separated from the part automatically. 3) the gate is small and the gate marks the glue is small. 4) the stress near the gate location is small, and the injection molded parts are not easy to warp. 1) injection pressure is large, and it is not suitable to use plastic material with poor fluidity. 2) generally use 3 plate mold structure, the mold structure is complex, and the cost is high. because several gate points can be designed, it is often used for shell parts with larger surface. 1) when the plastic flows through the gate, melt plastic distribues more evenly in the transverse direction and reduces the inner stress . 2) prevent air entry into the cavity and avoid defects ,such as silver streaks and bubbles. 1) the part can not be separated from the gate automatically. 2) the gate remaining material will leave on the plastic part and it need to be trimmed manually. commonly used to produce thin sheet and wide parts ,and poor fluidity material, such as PC, PMMA, etc. 2) the gate can be separated from the plastic part automatically. 3) both the two plate die and the three plate die can be applied. 1) the cloudy area is hard to remove. 3) the pressure loss from the gate to the cavity is large. it is suitable for plastic parts with external appearance with no gate marks allowed. 2) the gate location is inside the plastic parts, and will not effect the appearance of the part. 1) the appearance of the plastic part surface may find finger printing marks. 3) the unreasonable design would easily lead to break gate and block gate channel. commonly used for ABS, HIPS; not used for POM, PBT and other crystalline materials, also not suitable for PC, PMMA and other rigid materials, design should prevent the arc gate from broken and block the gate. Any structure that hinder the mold opening or ejection is referred to as undercut. The way to handle the under cut on the mold includes:sliders, lifters,core pulling, gear rotating , and etc. The most commonly used is the sliders and the lifters. The slider could be set on the static or movement mold plate, and sliders on movement plateis the most widely used. The slider generally consists of slider?body, locking block(heel), Gibbs ,cam(angle pin), wear-resistant block, spring and so on. The lifter generally is used to handle the under cut in the interior of the plastic part,while the slider generally treats with the external under cut of the plastic parts, but the lifters structure is simpler than the slider structure. The lifter has the function of releasing the internal under cut in the plastic parts, and it can also play the role of ejection. So the design of the lifter on the mold generally reduces the arrangement of the ejector pins. The lifter is composed of inclined top body, guide bushing, lifter seat and wear resistant block. 2 Responses to what is plastic mold? This is some really good information about plastic molding. I liked that you showed that diagram. That seems like it would help you understand molding.